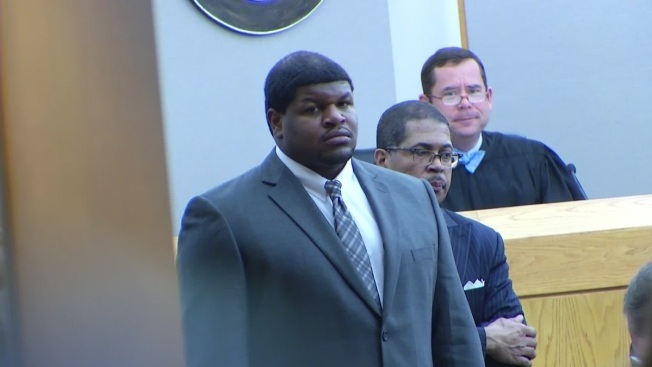 Former Dallas Cowboys player Josh Brent was convicted of intoxication manslaughter Wednesday for a fiery wreck that killed his teammate and close friend Jerry Brown. Jurors, who returned to court Wednesday after deliberating for about three-and-a-half hours on Tuesday, delivered the guilty verdict shortly before 4 p.m. after considering their decision for nearly 11 hours. Brent faces up to 20 years behind bars, though he is eligible for and has requested probation. Sentencing in the case will begin Thursday morning. Brent was charged in a December 2012 wreck in a Dallas suburb that killed Brown, a practice squad linebacker who was Brent's close friend and also a teammate at the University of Illinois. The two men were headed home from partying with fellow Cowboys at a nightclub when Brent lost control of his Mercedes, causing a fiery accident. Officers who arrived on scene said Brent was seen trying to pull Brown's body from the wreckage. Police say Brent's blood-alcohol level was tested shortly after the crash at 0.18 percent, more than twice the legal limit for drivers in Texas. Prosecutors last week argued that the burly, 320-pound defensive tackle had as many as 17 drinks that night of the crash. Brent's attorneys argued the blood tests used by police were faulty and that Brent could not have drank nearly that much. Attorney George Milner said his client was "guilty of being stupid behind the wheel of a car," not drinking beforehand. Brent retired from the NFL last year, but his ties to the Cowboys were prominent at trial. Two current players, Barry Church and Danny McCray, testified about hanging out with Brent and Brown, first playing video games, then having dinner and going to Privae, a Dallas nightclub. Jurors saw video of Brent appearing to hold bottles of Champagne in each hand and credit-card receipts that showed Brent had purchased three bottles. They also saw police dash cam footage of Brent losing his balance during field sobriety tests and occasionally stumbling over his words while talking to officers. The case now moves to sentencing. Milner has previously said his client should receive probation, and Brown's mother, Stacey Jackson, has said in interviews that she has forgiven Brent. Jackson could testify on Brent's behalf at sentencing. Prosecutors have indicated they will push for jail time for Brent and have talked about the potential to send a message about intoxication manslaughter. His conviction comes just after weeks of fierce debate about a North Texas teen, Ethan Couch, who received probation for intoxication manslaughter after a wreck that left four people dead. Couch's case, and the so-called "affluenza" defense his attorneys employed, became the subject of fierce, widespread scrutiny. Dallas County District Attorney Craig Watkins has attended parts of Brent's trial and whispered in prosecutors' ears during the questioning of one witness. Watkins told a sports radio station last year that prosecutors had the responsibility to make sure Brent "loses his freedom." Brown was signed to the Cowboys' practice squad in the 2012 season.